Free pick up from Caboolture. Time and day will be arranged. 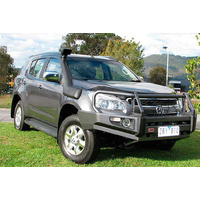 Roadsafe 4WD have developed their Blackhawk UCA range of product drawing from over 30 years of experience in the manufacture & supply of chassis parts including a full range of steering & suspension components. The Blackhawk UCA’s have been designed in conjunction with industry experts to ensure vehicle fitment is comprehensive. During the development process a large number of potential issues associated with lift were identified, and subsequent features were built into the product to overcome of offset them. 3 degrees of fixed Caster correction Roadsafe have identified this as the perfect amount of correction required for lifts ranging from 30-70mm. 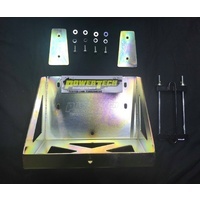 By providing a bulk, fixed amount of caster, this offers the ability to utilise the factory adjustment to fine tune the caster required for the vehicles lift, with the UCA not being the limiting factor for increased droop relative to the other components. Camber change to meet OE spec, if your application requires increased camber, we can offer offset bushings to provide more camber. Clearance to larger aftermarket wheels & tyres – we often see larger than standard size tyres with wheel offsets having clearance issues to the OE UCA, our Blackhawk UCA’s minimise this as much as possible. 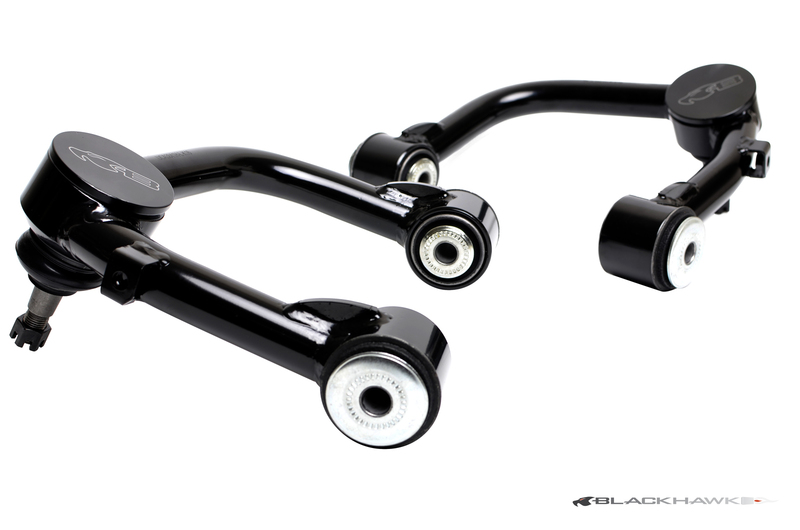 Clearance to suspension components & chassis – a large number of OE UCA’s hit the coil or the chassis mounts on during the suspension travel limiting the amount of travel you can achieve, with revised bends and clearances identified the Blackhawk UCA’s will not contact the strut or the chassis limiting travel unless specifically designed to do so. 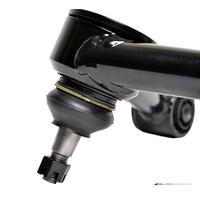 Fixed position ball joint – Blackhawk UCA’s do not use an adjustable ball joint. With a fixed location ball joint we are able to offer OE specification for the ball joint itself. The position of the ball joint housings have been rotated to ensure the ball joint is not the limiting factor with maximum down travel. Roadsafe specifically chose a fixed ball joint for a number of reasons – in off road applications the ball joint receives a large amount of “bump” loads, which over time can either knock an adjustable ball joint out of position leading to increased tyre wear due to a change in caster. 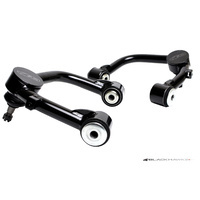 Changing from a fixed ball joint mount reduces the structural integrity of the mount and the mounting platform of the ball joint, with any remote traveling we need to ensure strength and reliability is not compromised. 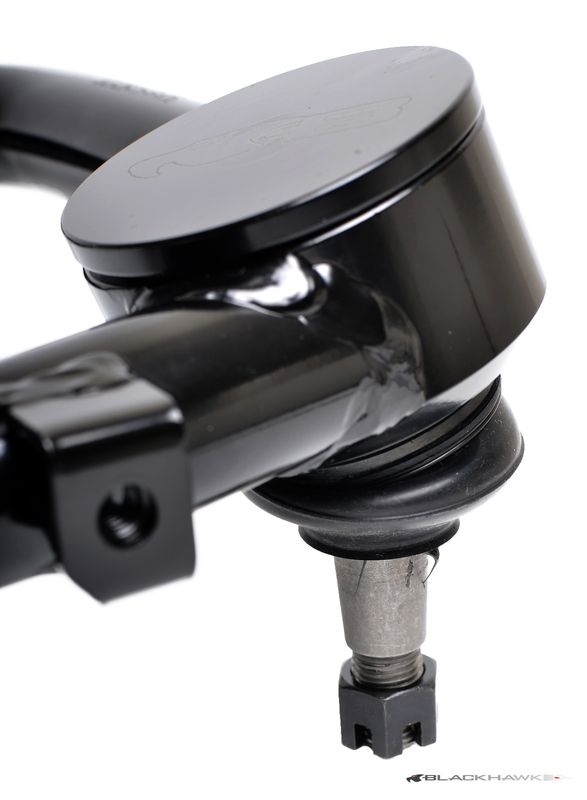 There will never be a need to adjust or re-adjust your caster once established with the Blackhawk arms as the ball joint cannot be knocked out of position. Maintain OE specification ball joint & bushings – regardless of where you may go, if you need to replace a ball joint or bushing you can use genuine replacement parts or aftermarket OE specification replacement items, regardless of how remote you are at home or abroad. 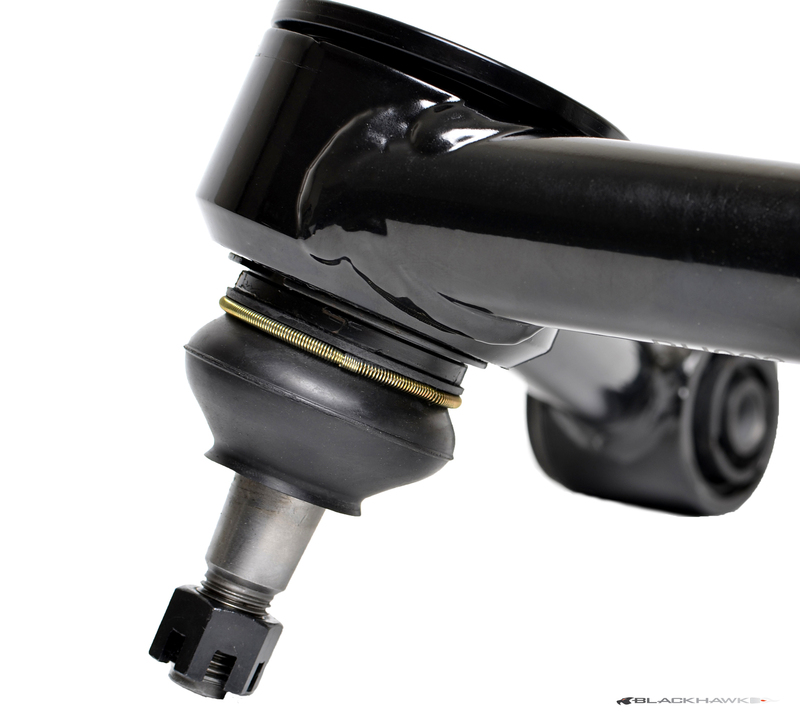 Ball joint binding – Often we see the ball joint limiting the amount of down travel because the OE ball stud hits the side of the ball joint housing, this creates a stress point on the ball stud creating an environment for potential terminal failure of the ball joint, it also limits the amount of down travel possible when used in conjunction with aftermarket suspension and longer shock lengths. Securing ABS lines – we incorporate tabs and mounts where practical so the OE lines can be secured discreetly where possible, reducing the potential of sticks and other debris from damaging the sensitive lines. Increased strength compared to the OE design – The design of the Blackhawk arms have shown with the use of FEA to be much stiffer than the OE arms, providing the driver with increased handling and response when the Blackhawk arms are fitted when compared to the OE arms, this is illustrated by the amount of deflection the FEA results have provided, with 3 times less deflection in the Blackhawk UCA’s. Does this rigidity negatively transfer to the vehicle? 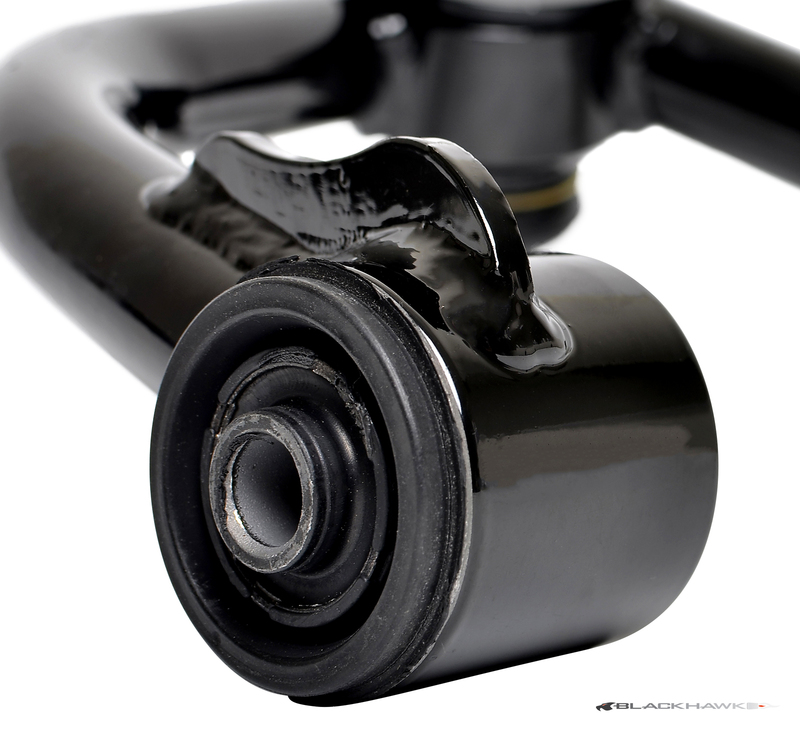 – No, because the Blackhawk UCA’s use OE Rubber bushings, any NVH (Noise, Vibration and harshness) is absorbed in the rubber bushings before it makes it way to the chassis, you may find an increase in wear in the bushings which is directly related to how you drive the vehicle, the bushings are a consumable component of any vehicle, however you should expect years of trouble free service before you should need to replace the bushings. Heavy Duty Long life Ball joints – Roadsafe 4wd specially redesigned the OE ball joint into a more robust design, due to the nature of the application the 4wding community requiring a serviceable component. 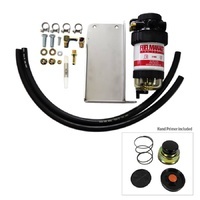 Subsequently Blackhawk UCA’s have a ball joint that is manufactured in the “hard to hard” style with a locating nylon disc that the ball stud terminates against, grease is pumped into the assembly through the top keeping everything lubricated and keeping any potential contaminants out of the boot region. The ball studs and seat area of the housing are all heat treated forming a hardened surface with the purpose of long life and limited wear. Dust Cap – Blackhawk UCA’s that utilise a press in ball joint feature a machined alloy dust cap, black anodized incorporating the Blackhawk logo, to deter corrosion. 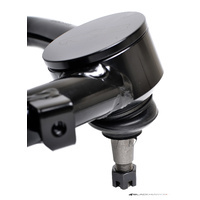 The cap position results in creating a sealed housing to protect the greasable top section of the ball joint from the elements such as water, dust & mud. Finish – All arms are sand blasted upon completion and E coated black for a durable discreet finish. E coating is the same process the vehicles manufacturer used for the original equipment you are replacing. OE & Blackhawk Upper control arm samples have been computer modelled and subsequently FEA tested with static and bump/lateral load tests. These results have been reviewed and certified by VASS Engineers locally who unequivocally confirm the design and materials chosen to manufacture the Blackhawk UCA’s by long term suspension manufacturer Roadsafe Automotive products are of sound design and furthermore, exceed the original equipment by design in strength and functionality. A key feature identified by the FEA testing was the amount of deflection seen between the OE component and the Blackhawk UCA, with the Blackhawk arms being 3 times stiffer than the original equipment, resulting in significant increased handling and feel of your vehicle as the suspension cycles. Based on years of experience in manufacturing a large volume of suspension components, Roadsafe is able to ensure the manufacturing process is of a standard delivering a high quality component to market. Blackhawk arms have been designed and manufactured to be ADR Compliant; this is a confusing term within the industry as there is not an ADR (Australian Design Rule) to comply with specifically for this product group. So what does “ADR compliant” mean? Roadsafe have ensured the Blackhawk UCA’s mount to the vehicle in the standard fitment position, by not moving or changing any of the mounting points at the chassis rail, by utilising rubber bushings at the chassis we have also followed the OE specifications on the vehicle. 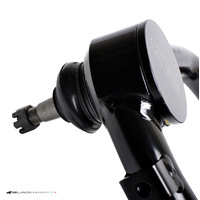 Our new HD Balljoint is manufactured as a press fit, circlip retained (where applicable) ball joint in a fixed position, meaning it mounts in the same fashion as the OE component following your vehicle manufacturers general build practice – we have developed a product that complies with the ADR ruling as stated in the NCOP that it is manufactured to meet or exceed the factory item, with built in features & benefits to suit raised suspension. Some of our customers would like to consult with a VASS approved engineer in order to have the ADR compliant Blackhawk UCA’s and their fitment to your vehicle certified, in order to receive the appropriate documentation that your vehicle is ADR approved for road use with the Blackhawk UCA’s. Help other Power Tech Industries users shop smarter by writing reviews for products you have purchased. Make 4 interest-free payments of $291.25 fortnightly and receive your order now.